Mizher’s funeral procession featured many individuals wearing military gear, PFLP paraphernalia, and PFLP banners. Mizher’s body was also adorned in PFLP paraphernalia, as well as a PMRS orange reflective vest. 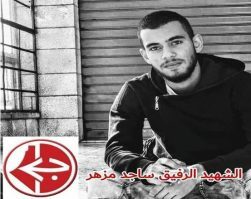 Mizher posted a picture of what appears to be his cousin, Arkan Thaer Mizher, who was killed on July 23, 2018. Arkan’s body is wrapped in a PFLP flag.